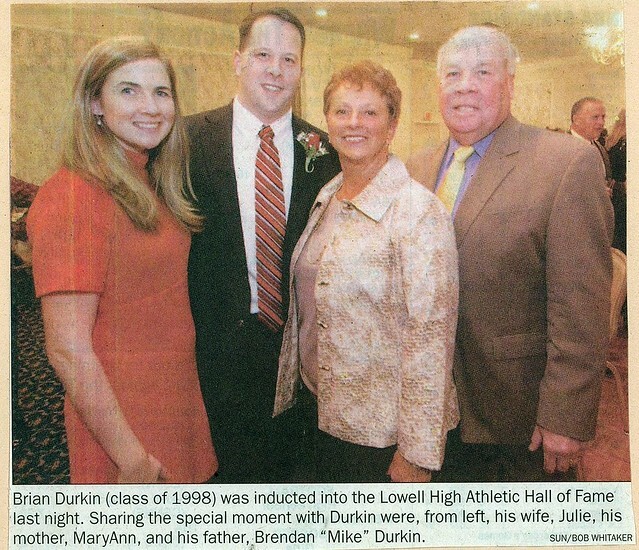 A student-athlete in the truest sense of the word, Brian P. Durkin earned well-deserved plaudits and honors in both the academic and athletic arenas during his careers at Lowell High School and later at Boston College. 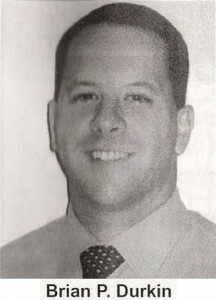 Brian was a member of the National Honor Society in both his junior and senior years at Lowell High School and won the John Beaulieau Valedictory Award emblematic of the Outstanding Male Athlete in the class of 1998. 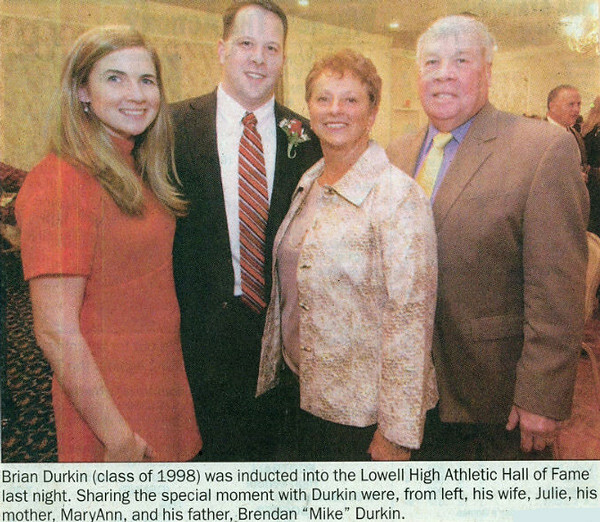 The first member of a Lowell High School Boys Swim team to earn induction in the Lowell High School Athletic Hall of Fame, Brian was one of the bulwarks of the early days of the LHS Boys Swim program. A four-year MVC All -Conference selection, three-year Lowell Sun All-Star, and team Captain (1997–98), Brian set school records in the 100-yard backstroke, the 200-yard medley relay and as part of the Raiders’ 200-yard medley relay. A four-year varsity letter winner, he was the team’s leading individual scorer during his sophomore, junior, and senior years (1996–1998). 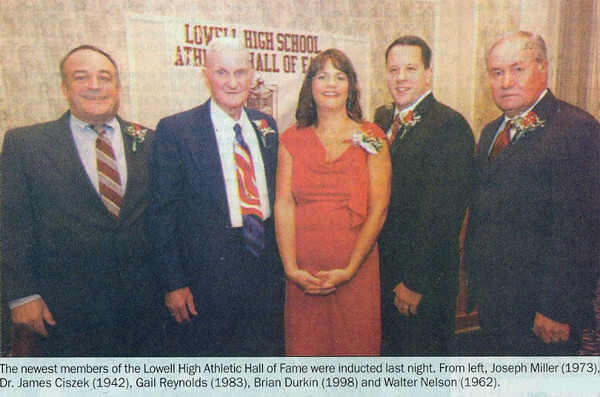 Although his swimming credentials are significant, it was on the baseball field that Brian truly established himself as one who could stand alongside the greatest athletes ever to grace the hallowed halls of Lowell High School. A three-year varsity performer for Coach George Cunha, Brian made his mark as a sophomore (1996), batting .393 and hitting 2 home runs as the Red and Gray compiled a 15–6 record. A junior (1996–97) Brian continued his stellar play as the Raiders recorded a 16–6 record, advancing into the state tournament. He batted .424 and hit 2 home runs and 3 triples while compiling a slugging average of .652. Brian was named to the MVC All-Conference and Lowell Sun All Star teams. He was selected to the Top 96 in New England Invitational and JET/CRO College and Professional Recruiting Combine. During his senior year (1997–98) Brian compiled one of the most outstanding seasons in the over 100-year history of the Red and Gray Baseball program. The team Captain batted .413 with a slugging percentage of .747. He led the team with 31 hits, 27 runs scored, 4 triples, 4 home runs, and 18 RBI. Brian was named team Co-MVC and for the second consecutive season MVC All-Conference and Lowell Sun All-Star honors. He also received recognition as one of the most outstanding high school athletes nationally with his selection to Who’s Who in High School Sports. Brian appears with regularity in the Lowell High Baseball Record Book. He is listed in the top ten in at least 10 different categories, highlighted by 4th in career batting average (.411), 4th in career hits (81), 4th in career runs scored (64), and 4th in career home runs (7). After graduation, Brian matriculated at Boston College, where he continued to display his prowess on the baseball diamond and in the classroom. During his junior (2000–2001) and senior (2001–2002) seasons, He won All-Big East, All-New England Division I, and All-Region honors as a member of the Eagles nine. His career statistics include a .332 batting average, 148 hits, 99 RBI and 28 home runs (3rd in BC history). A Dean’s List student, Brian also won numerous academic awards, including Big East Academic All-Star Team, National Society of Collegiate Scholars, and the prestigious Boston College Athletic Director’s Award for Academic Achievement.